An overweight suitcase can run you $100 in fees, but what if you could weigh your suitcase by simply lifting it off the ground? That's just one of many utilities that's built into a new smart luggage brand called Raden, which launches Tuesday. Raden charges your phone, gives you details about TSA wait lines, and alerts you via Bluetooth when your bag is coming down the carousel. Founder and CEO Josh Udashkin, 32, realized there was a need for Raden while at the airport. There are startups improving on everything from eyewear (Warby Parker) to speakers (Sonos) -- why not luggage? Udashkin said his goal was to create an "empathic" luggage brand -- one that is chic, practical and accounts for our tech-centered lives. He left his job at Aldo in April 2014 and has spent nearly two years bringing Raden to market. It meant spending a lot of time in the Times Square Marriott Marquis, where he'd meet with experts in marketing and product sourcing from Tumi. (TUMI) He hired them as consultants during Raden's first year. He's banked $3.5 million from VC firms like First Round Capital and Lerer Hippeau Ventures, and high-powered individuals like Rachel Zoe. Ahead of its launch, CNNMoney got a preview of the 22-inch carry-on bag (which costs $295) last week. The bag itself -- conceptualized by designers from Beats by Dre and Bonobos -- is made out of durable Makrolon polycarbonate and weighs just 7.5 lbs. Inside is a removable compact battery with two ports that are accessible from the outside of the case. According to chief product officer Justin Seidenfeld, who formerly ran product at Quirky, the battery averages about five full phone charges. They've also designed a sleek companion app to access all of Raden's features. It will even let you order an Uber. "In the hotspot of loss -- the airport -- Raden will be able to help locate your stuff," said Udashkin. 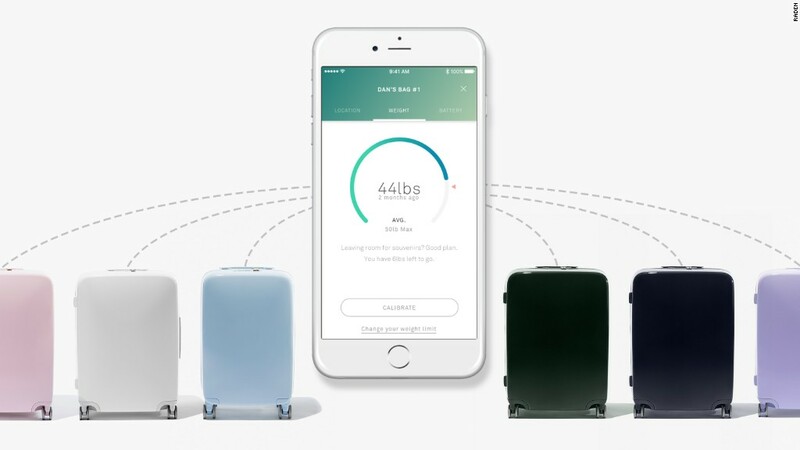 Raden isn't the first to launch a smart luggage startup: Competitor Bluesmart launched as an Indiegogo campaign in 2014 and shipped out 10,000 presold carry-ons in August 2015. It has many of the same features as Raden, but only one model for now. Raden, on the other hand, comes in a 28'' check-in size and is available in seven colors. And it's cheaper (Bluesmart's bag costs $399). In addition to launching its ecommerce store, Raden is opening the doors of a store in New York City's SoHo neighborhood as well.